Sound Stage Theatre, 1409 National Park Dr. The Outer Banks Seafood Festival is set for Saturday, October 20, 2018. The 7th Annual Seafood Festival will feature amazing local seafood, outer banks restaurants, and live music. The mission of the Outer Banks Seafood Festival is to provide a fun and educational experience promoting, honoring and celebrating our coastal seafood heritage and community. 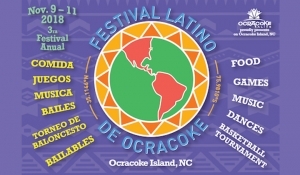 Celebrate the Latino community on Ocracoke Island at this vibrant festival honoring Hispanic traditions and cultural unity. Enjoy authentic Mexican food, music and dances as well as games and fun for all ages. Events will be held over 3 days at the Ocracoke School and the Ocracoke Community Center and is open to residents and visitors alike. The festival is presented by Ocracoke Alive; visit their website for a complete schedule and more information. Come to Sanctuary Vineyards in Jarvisburg for a Saturday of Wine, All-You-Can-Eat Steamed Oysters, BBQ and Crabs (while they last!) courtesy of "I Got Your Crabs" in Kitty Hawk. 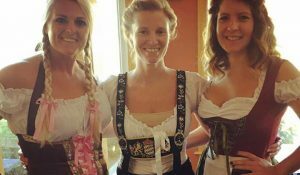 There will be wine sampling, new wine releases, live music, a signature wine glass to keep, and family fun. Tickets are $40 per person, available online at www.sanctuaryvineyards.com or in any Cotton Gin store location or at I Got Your Crabs. The holidays would not be complete without an old fashion Christmas parade and Hatteras Village is where you can find one. For warm, hometown, holiday spirit, this is an event that no one should miss. After the parade and as twilight draws nigh, Santa is transported throughout the village on one of the local fire trucks wishing holiday cheer to all the local youngsters as well as to those who are young at heart. Celebrate National Kite Month and the start of Spring with Kitty Hawk Kites! On April 19th & 20th from 10am to 4pm, experience the sights of massive 30-to-100-foot kites flying high over Jockey’s Ridge State Park. Across the street from the dunes outside Kitty Hawk Kites, take your picture with the Easter Bunny, and let your kids join in the fun during our annual Jockey’s Ridge Crossing Easter Egg Hunt!